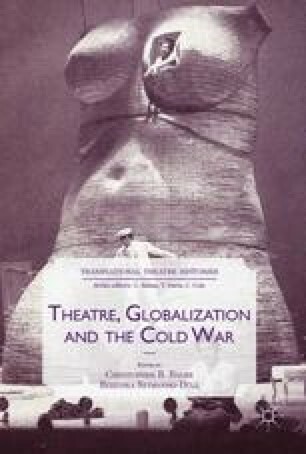 Focusing on the tour of the Romanian Bulandra Theatre to the Theatre of Nations Festival in 1969, this chapter argues that, even in its period of relative thawing, the Ceauşescu communist regime instrumentalised cultural events to fabricate its positive image abroad. Analysing previously unexamined archival documents, the chapter reveals multiple exchanges between Romanian officials and the French organisers, and their disagreement over the Bulandra productions that would feature in the festival. The dissensus revolved around Romanian-born French playwright Eugène Ionesco and the work of a now forgotten Romanian director, Crin Teodorescu. The chapter explains the paradoxical situation of Romanian directors famous in the West, such as Lucian Pintilie and Liviu Ciulei, both involved in the 1969 tour, who were allowed to work abroad even after they had been banned from doing so in Romania. The paper examines the Western success of Romanian theatre in this period in relation to the ideological divide of the Cold War, and to common traits countries shared across the Iron Curtain, such as a directors’ theatre culture and nationalism.